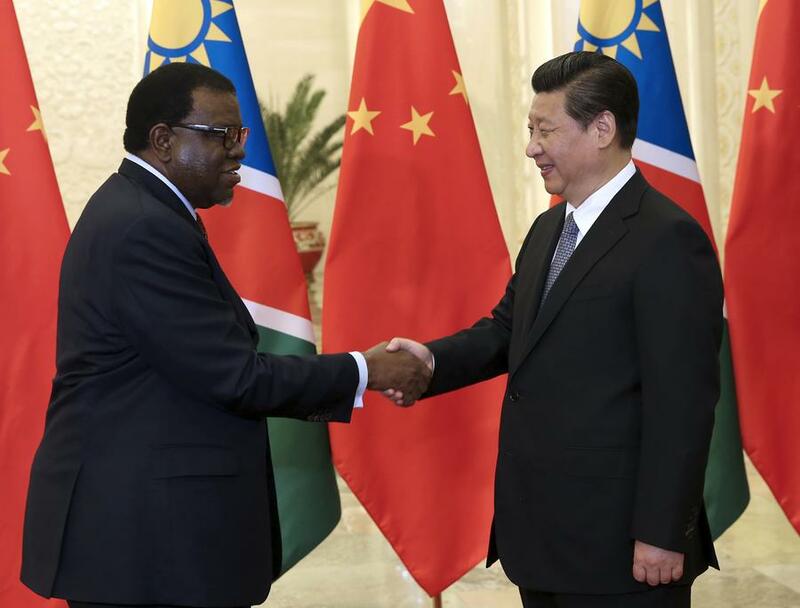 Chinese President Xi Jinping (R) meets with Namibian President Hage Geingob in Beijing, capital of China for the first time. Geopolitics: As United States contemplating protectionism, after realized that its usual free trade interest in African continent is becomingly under unfathomable threat by the Chinese global influences. This should also noted that Namibia will be a battleground in the next economic frontier, where eat and west will collide. Beijing has emerged as a leader in the new world order , where its modern military forces is being remodeled to match any possible threat either from US or locally, The growing economy power of China is another concerned to US's interest in the region. China is an increasingly important player in the politics, economic development and security of Africa. Historically, China has prioritized strong diplomatic relations and political ties with African states with an ideological aspiration anchored on the solidarity among the Third World countries, without any string attached. Namibia play a key role in Sino-Africa's socioeconomic relationship,this has been consolidated by multi facial factors such as historical ties between Chinese PLA and PLAN (SWAPO Party) during liberation struggle and other common political orientations. The tumultuous geopolitics about the tensions between the United States and China that now exacerbated by international affairs like North Korea’s nuclear ambition, where some nations's fates subliminally are intertwined as well: And Namibia is one of them. Nam-Sino Bilateral: Xi Jinping pointed out that Namibia is an important partner of China in Africa. The traditional friendship forged by older generations of leaders of both countries is a valuable treasure for us. The Chinese side is willing to, together with the Namibian side, transfer the bilateral friendship into more driving forces for cooperation and development. Both sides should enhance political mutual trust, strengthen exchanges in all areas and deepen practical cooperation. We encourage Chinese enterprises to actively participate in infrastructure construction and operation of transportation, ports and others in Namibia so as to help its economic and social development. Founding Father of the Namibian Nation Dr Sam Nujoma and the Chinese community in Namibia at exhibition organised by the Chinese Embassy in Windhoek, Namibia March 2015. 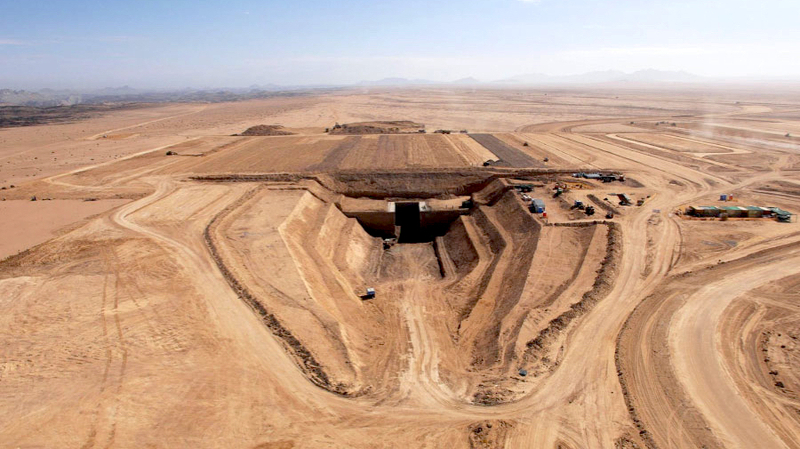 Husab Uranium Mine expected to triple output by 2017, and becoming the world’s third largest producer of the commodity. The $2-billion mine worth-project will produce up to 15-million pounds of uranium a year. Both sides should also expand communication and cooperation in culture, education, youth, media, tourism and other areas to consolidate the social and public opinion foundation for bilateral friendship. China is willing to keep close collaboration with Namibia in international affairs so as to protect the common interests and rights of developing countries. Hage Geingob noted that Namibia and China enjoy a long-standing friendship. China offered valuable support to Namibia before and after independence in many sectors of development. Under the new situation, the Namibian side is willing to strengthen cooperation with the Chinese side in infrastructure construction, agriculture, new energy development and other areas. China with its population of 1.3 billion has became the world's powerhouse. It contributed 39% to world growth in 2016, as according to the Forbes financial statistics, and its influence in global economy is growing. President Xi Jinping during the World Economic Forum Annual Meeting at Davos in January 2017,told a packed conference hall that the "Chinese were leaders of our times”. He said his country is ready to make globalization work for everyone, and not just the few. “The people of all countries expect nothing less from us, and this is our unsinkable responsibility as leaders of our times,” he said. China in post-independence has involves in projects and infrastructures development in many African nations and built military bases for poor African countries started from Djibouti;Kenya;Tanzania;Mozambique;Seychelles and Madagascar,and then Namibia. The Chinese security agenda on the continent won’t be established like the U.S.-military style that envisioning to militarized entire Africa via AFRICOM which is a war proxy seeking regime changes. Although, China too won’t exclude its presence so-called Overseas Strategic Support Bases with peaceful means in accordance to international rules. The boosting of China's strategic policy will maintain the balance from western aggressions and enhance China’s effectiveness in taking responsibility for maintaining the safety of international maritime routes, thereby maintaining regional and world stability. Namibian President Hage geingob recently commissioned two state-of-the-art Chinese-built naval vessels at the harbor town of Walvis Bay. The two submarine chasers, Brukkaros and Daures, boast surface and under-surface targets attacking capabilities. They were donated by the Chinese People's Liberation Army and arrived in Namibian waters in August. Namibian president Hage Geinkob commissions the state-of-the-art naval vessels (two submarine chasers) at Walvisbay donated by the Chinese People's Liberation Army. The Namibian president thanked China for its assistance to the southwestern African country in protecting its territory and maritime resources. "The delivery and incorporation of the two submarine chasers into our naval fleet will add tremendous value to Namibia's naval combat surface and under-surface capability, as well as augment the country's maritime patrol and surveillance capability," Geingob said. "Our maritime economy is a major contributor to job creation and economic growth. Given our large coastline, the Navy faces a huge challenge in ensuring that it protects the country against any and all maritime threats. It is therefore of paramount importance that we continue to increase our naval capabilities." Geingob also thanked China for being an all-weather friend, adding that it is better to have one loyal friend than a hundred fair-weather friends. US vs China: American and Chinese civilizations are culturally opposite to one another in the view of how the world should be governed and the values of humankind. The Chinese see themselves as the center of the universe. Even President Xi Jinping declares in his published work 2014, "The Governance of China": "China's continuous civilization is not equal to anything on earth, but a unique achievement in world history." Quite to the contrary, Americans see themselves as exceptional world policy, beacons of human rights, bulwarks of civilization and champions of democracy. In the west nationalism of most eastern societies is regarded as an odd. And so too western democracy in the east termed as immoral advocate. 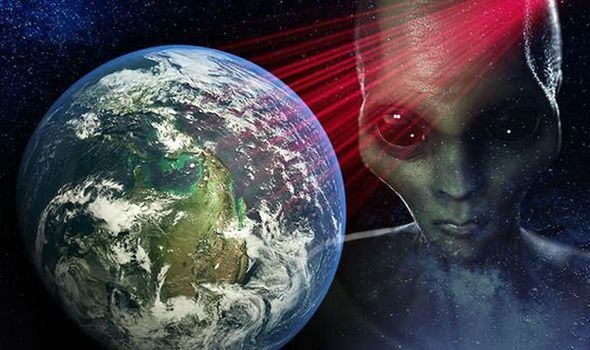 Understand that both two countries American and Chinese technically they are at war of which each strives to displace the dominant power of another. China will continue with its long-term of continental expansion in offering social commitment, as the Chinese people are more historical compatible to African people themselves and oftentimes their gifts is widely open without any deceptions and intents. The United States's uni-polar arrogance and hegemony which now substituted the old fascism will undoubtedly be left behind. The game is on, and the United States is the underdog. Many experts have concluded that the de-certification of Iranian nuclear deal that was signed between European leaders, International Atomic Energy Agency (IAEA) included Washington, has taught world leaders to reconsider their decisions whenever dealing a country like US.